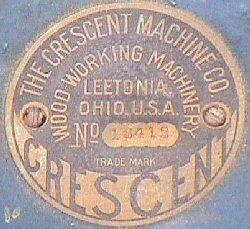 An ongoing project of the Old Woodworking Machines web site is to document as many examples of machines and their serial numbers made by the Crescent Machine Company, OH as possible. The reason we want to document these machines it in order to create a rough timeline as to when a machine was made by Crescent. Our theory is that if we can create a database of Crescent machines and their serial numbers, we can begin to look for the subtle changes made by Crescent over the years as they improved their machinery which can be determined by old Crescent catalogs, ads and similar documentation. If you have a machine made by the Crescent Machine Company, we would like to encourage to you to participate in the Crescent Machine Registry by sharing information about your machine. Serial Numbers were typically stamped somewhere on the machine or on a machine tag using hand stamps. As such the serial number will be stamped in depressed numbers. Most Crescent machines also have raised numbers cast onto the different parts. These are not serial numbers but are instead part numbers. Many people confuse the raised part numbers with the stamped serial number. Our current theory is that Crescent assigned serial numbers on their machines as orders were placed with the factory or possibly when the machine was shipped from the factory. Our reasoning for this is that at least one example has shown up where multiple machines which were ordered in a bulk order all were assigned sequential serial numbers. Since the machines were different types of machines which would have most certainly been completed in the factory at different times, it is only logical that serial numbers were assigned as orders were received. Another case, in which we have been able to examine the official Crescent Machine Record, indicates that the serial number was assigned when the order was placed - even though a machine was not available for shipping for a whole year afterwards. Because of this, it is quite possible that machines could have been completed and sat in the factory warehouse for a considerable time before they were actually shipped and assigned a serial number. 12345 - A four or five digit number This style of serial number is the most common of all serial numbers and was used by Crescent from their earliest days up until around 1947 or 1948. It is possible that less than four digits may have been used on the very earliest of machines but no examples of a serial number with less than four digits have been seen. The lowest number serial numbers seen to date have at least four digits. CA-1234 - The serial number prefixed by the letters "CA" began around 1947 or 1948. These serial numbers have all been found a small red tag with both the Crescent and Rockwell names. This style of serial number was used until at least 1949. 1234-A - This serial number group is somewhat confusing. 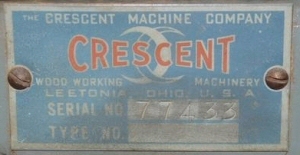 Around 1947 or so, the Crescent factory began making several machines that were designed by Delta. These machines included the Delta 20" Band Saw, the Delta 12-14" Table Saw and the Delta 8" jointer (the 8" jointer was really more of a hybrid of Delta and Crescent designs). When these machines left the factory, they were badged as being both Delta and Crescent machines. The current theory is that when Crescent began doing this, they put a different serial number tag on these machines that said "Delta Power Tool Division, Rockwell Manufacturing Company, Milwaukee 1, Wisconsin." This is when we believe that the serial numbers suffixed with the letter "A" began. 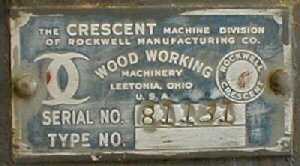 What makes this confusing is that on or about Jan. 1, 1950, Rockwell changed the name of the Crescent division from the "Crescent Machine Division" to the "Power Tool Division". At this same time, all machines leaving the Crescent plant, both the Delta/Crescent machines and the old line of true Crescent machines all had serial numbers with the "A" suffix - the serial numbers on these machines appears to have been merged in with the serial numbers on the Delta/Crescent machines. The true Crescent machines, however, had a serial number tag that read "Power Tool Division" while the Delta/Crescent machines continued to have serial number tags that read "Delta Power Tool Division." 1234-B - Our current theory is that when Crescent used serial number 9999-A that they went to 0001-B. Dates of when this conversion took place are currently unknown. C-1234 - The serial numbers prefixed by the letters "C" are machines made after Rockwell sold the Crescent line to Enterprise and were used up until at least the early 1970's. E-12345 - One Crescent machine has been found with a serial number prefixed by the letter "E". It is currently unknown how this machine fits into the whole serial number scheme. The one machine with an "E" series was badged as being made by Enterprise - perhaps hence the "E"? Unfortunately, Crescent did not have a standard place that they stamped serial numbers on machines. Often, it is simply a search until you can find the number. While the serial number might be found pretty much anywhere on the machine, here are some places that serial numbers have been found in the past. Use this as a guide to begin your search but do not give up looking just because it is not where we suggest looking. Bear in mind that some machines had the serial number stamped on metal tags while many other machines simply had the number stamped into cast iron of some part of the machine. Some machines have been found with serial numbers stamped on both the machine itself as well as on a tag. 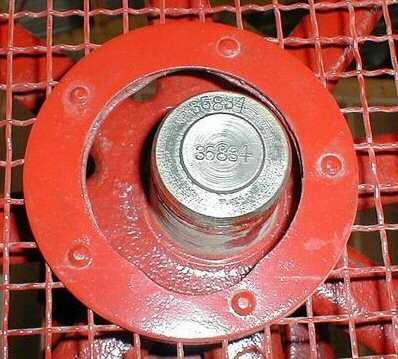 The first place to look for a serial number is on any plates riveted or screwed to the machine. Depending on when the machine was made, it might have a brass or aluminum tag with the serial number clearly stamped on it. Be aware, however, that most Crescent machines did not have any tag on them at all, serial numbers were stamped directly to the machine. 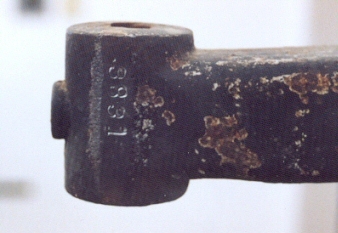 This style tag is found on early Crescent machines. Exact dates are not known at this time but appears to have been used from around 1906 through around 1912. When this tag was not used, serial numbers were simply stamped on the machine. Another example of the early 1940's tag. This style tag was used for a short period of time after Rockwell took over Crescent in 1945 until they began using the serial numbers prefixed with the letters "CA-" around 1948. This style of tag began showing up on Crescent machines after serial numbers began using the "CA-" prefix. Use began around 1948 and continued until at least 1949. These serial numbers were all suffixed with the letters "A". Use began around 1951 to sometime in 1952. This serial number tag with the name "Delta Power Tool Division" started to be used around 1952 and was used until Crescent was sold to Enterprise in 1953. The serial numbers on this tag are suffixed with either the letter "A" or "B" depending on when they were made. These machines were badged with both Delta and Crescent logos. Serial number tag used on Crescent machines built by The Enterprise Company - these machine were made from about 1953's on. The bulk of machines made by Crescent simply had serial numbers stamped onto some part or parts of the machine. While there were not standard places to stamp these numbers, many machines are found with the numbers in similar places. The following is a guide as to where to start looking for your serial number. Keep in mind that the numbers can sometimes be hard to see or find if many coats of paint have been applied to the machine. It is often necessary to scrape away part of the paint in order to read the number. On jointers, the serial number is typically stamped onto the end of either the in-feed or out-feed table. Some serial numbers on Crescent band saws have been found stamped under the main table. 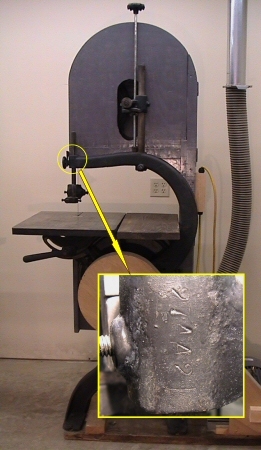 Serial numbers are often found on the front side of the upper arm of the saw stamped onto upper wheel adjustment device. Serial numbers have also been found stamped onto the wheel and shaft of the upper band saw wheel as above. On a very early four digit serial number 20" band saw, the serial number was found stamped on the front arm. At least one serial number has been found on the base of the machine on the out feed side. If you can provide any other information that might positively identify the date the machine was made, that would also be very helpful! We also would strongly encourage you to Submit Photos to the VintageMachinery Photo Index. Use the Crescent Machine Registry to determine where your machine falls into the current list of machines. Where we can provide dating information about a particular machine, we try to include it in the registry. Look at the collection of Publication Reprints listed in the Manufacturers Index entry for Crescent Machine Company. Often, you can use old catalogs to help determine a time frame your machine might have been made. Call Alloy Machining to see if your machine is in their records. Alloy Machining is the current owner of the old line of Crescent machines. They have some records of when machines were made - mostly from the early 1940's onward. They may not have your machine in their records but if they do, they can provide you with the date that it was made and very often other information on your machine. Alloy Machining can be reached at (330) 482-5543. Here is a collection of Crescent Machine Records that we have scans of right now. If you have or get a Machine Record for a Crescent machine, please share an image of it with us.